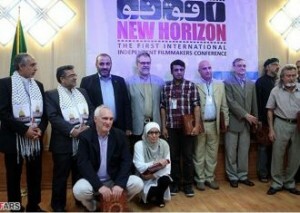 Mark Weber, Director of the Institute for Historical Review, recently spent nine days in Iran. In this lecture, he reports on his visit. Highlights included a meeting with Iranian President Mahmoud Ahmadinejad, an appearance on a televised public affairs program, and a lecture on the Jewish lobby to 800 students. Published: October 4, 2012 | This entry was posted in Counter-Currents Radio and tagged American foreign policy, Counter-Currents Radio, Iran, Israel, Mahmoud Ahmadinejad, Mark Weber, podcasts, the Jewish question, Zionism. Both comments and trackbacks are currently closed. “Pure and indigenous cultures as the product of centuries-old efforts of nations, the common denominator reflecting human profound feeling and love towards beauties, and the force which breeds diversity, cultural vividness, and social dynamism, are under constant attacks, and susceptible to extinction. After having been socially compelled to stand at attention for the playing of a Toby Keith “Go America” song at the local rodeo recently, I have little doubt as to my noble folk’s desire to see these strange-but-equal people murdered. It’s just a matter of time. I still don’t understand the pandering to radical Muslims, as if they have any more good will toward the kuffar than the Jews have toward the goyim. Love for the Other has been so deeply ingrained in the Western mind. What does the triumphant Islamist Ahmadinejad, who supports flooding the West with Muslim immigrants, have to do with us? He is no friend or ally of our people. Instead of breaking bread with jihadists, we are better served by expelling all the Muslim Brotherhood front groups along with AIPAC from the U.S. The Muslim Brotherhood will never be expelled until we deal with the Jewish problem first. This is the only reason why White Nationalists should support Muslims ( within reason). Do not mistake political realism for love. Our number one enemy is the Jew. Their power must be broken before the idea of freeing ourselves from Muslim cultural encroachment can even be entertained. To be very clear, I am using the word “support” to mean geopolitical support. Fight against your neighborhood mosque. Fight very hard. But always side with the enemies of Israel in matters of foreign policy. For the life of me I cannot understand how anyone could feel differently. Immigration and the destruction of our lands and communities is first and foremost a Jewish problem. Breaking the Jewish stranglehold on the world should be the number one priority for anyone concerned with White survival. If that means pretending to care about Palestinians then so be it. We are under attack and running out of time. We should use Muslim barbarism and rage to weaken Jewish defenses. Israel is about to get even more White people slaughtered for their interests and will thank us by further rotting our culture with their depravity. It is a question of life and death. There is a Jewish Empire on the horizon and I will support anyone who helps me fight it at this particular moment in history. We are in the “last chance” stage here. I would advise not seeing Radical Islam as being a representation of the threat we face. The biggest problem in my opinion are African ‘Christians’ and increasing numbers of less religious Muslims. Pro-Immigration rhetoric by countries like Iran are long term real politik in action. Their enemy is the Internationalist West: International Finance and Zionism which can flex it’s power thanks to the advanced Western economies that White Europeans have built. Though the current Neo-con interventionism has it’s roots in Jewish interests Western interference in Iran, Arabia and the world more generally has not always being Jewish led but by Anglo interests as well. The British Anglo Persian Oil interest in the early 20th century whereby the British effectively chose who ran the country, the occupation of Iran in WW2 whereby the ruling monarch was changed, as the prior one was sympathetic to the axis powers and the 1953 coup. While the majority of White people did not benefit from colonial interests (it was there tax money paying to maintain these colonies so others go rich) nor had the vote for much of the period of the British Empire they will still view it as being down to the White man. Just like many simplify the issues we face as a ‘Jewish problem’ the non-European world view their historical difficulties as the ‘White problem’, and our provided much friendly propaganda and leverage by the ‘left’ within Western countries. They recognise as clear as day the declining demographics of Western societies which will diminish the threat to their own nations (Iran, Syria etc). That was an excellent speech. Sobering and clear. The gulf between the simulacra and the reality is really quite disturbing. I read this article once where scientists said that people only go to internet sites that confirm what they want to hear. I thought about that and realized that for me it was true, so I started to deliberately go to sites that were unsettling to my comfort zone. I especially went to sites that were demonized by the site I was on, just to see if what they said was true. Mostly not. Then I got into a culling stage. I get disturbed alot here and that is a good thing.